The misrepresentation and misapplication of the United States federal income tax constitutes the largest acquisition of wealth by way of deception in history. A handful of government lawyers fabricated an intricate maze of legalese which created a perfectly Constitutional tax (a tax on income derived from certain types of international and foreign commerce), but which at the same time could easily be misread to give the impression that the income of all Americans is subject to the tax. For decades, the American people have been "conditioned" to believe that the income tax applies to all income and trained to pay "their" taxes. 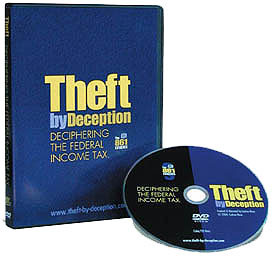 All the while, however, hidden in a previously nearly universally misunderstood (therefore misapplied) section of the law known as Subchapter N, Section 861 was the truth that the income tax is NOT a direct tax on incomes but is an indirect tax imposed only on those individuals engaged in certain types of international and possessions commerce. Most Americans are engaged in purely domestic commerce (commerce that occurs entirely within and between the 50 states). Subchapter N proves that domestic income received by residents of the United States (most incomes) is not taxed, due to Constitutional restrictions on Congress' power to tax.